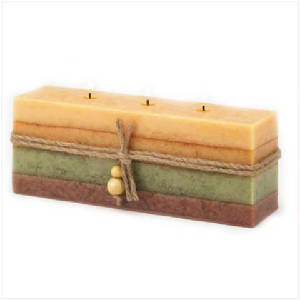 Triple-wick brick shaped candle creates an instant striking centerpiece! 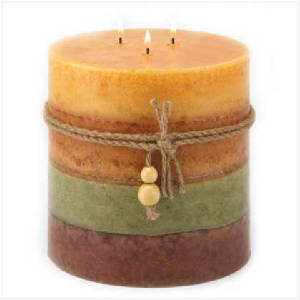 Warm bands of color add earthy appeal to this long burning spice scented candle. Paraffin wax. 9 1/2" x 2 1/2" x 3 1/2" high. 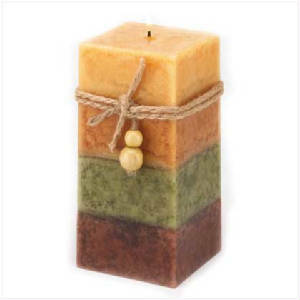 With substantial proportions and bold bands of color, this giant pillar candle is guaranteed to impress! Autumn Spice fragrance is a delightful complement to a sunny color scheme. Triple Wick for long-lasting enjoyment. Paraffin wax. 6" diameter x 6" high. A stately squared shape and bold bands of color enrich a tall pillar candle with designer style. Sweet, spicy fragrance and beaded rope accent add boutique touches. Paraffin wax. 3" square x 6" high.